Is $20 the next stop for oil? Now that the oil glut has caused prices to crash below $30 a barrel, turmoil is rippling through the energy industry and souring many of those loans. Dozens of oil companies have gone bankrupt and the ones that haven't are feeling enough financial stress to slash spending and cut tens of thousands of jobs. For instance, Wells Fargo (WFC) is sitting on more than $17 billion in loans to the oil and gas sector. The bank is setting aside $1.2 billion in reserves to cover losses because of the "continued deterioration within the energy sector." "The biggest area of stress" is the oil and gas space, Marianne Lake, JPMorgan's chief financial officer, told analysts during a call on Thursday. "As the outlook for oil has weakened, we would expect to see some additional reserve build in 2016." Citigroup (C) built up loan loss reserves in the energy space by $300 million. 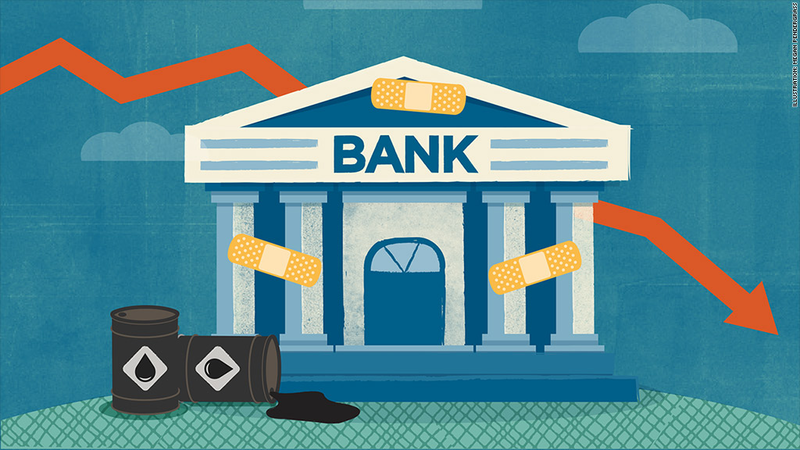 The bank said the move reflects its view that "oil prices are likely to remain low for a longer period of time." Related: $10 oil: Crazy or the real floor beneath the oil crash? 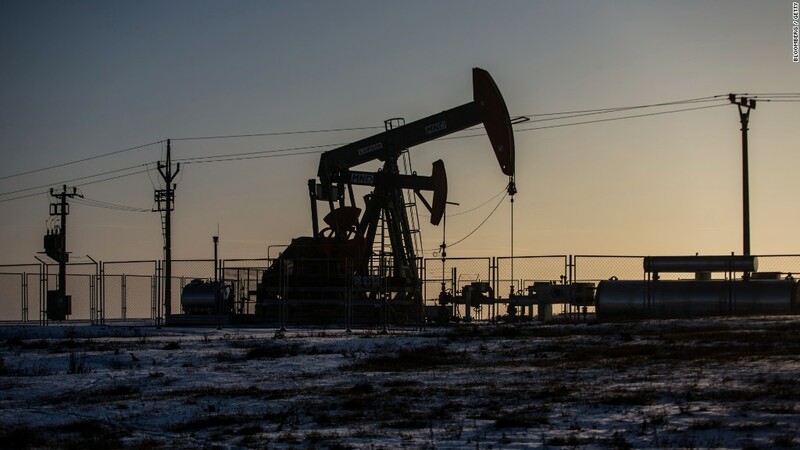 The oil crash has already caused 42 North American oil companies to file for bankruptcy since the beginning of 2015, according to a list compiled by Houston law firm Haynes and Boone. It's only likely to get worse. Standard & Poor's estimates that 50% of energy junk bonds are "distressed," meaning they are at risk of default. "There is a lot of distress in the industry. There will be a lot of pain but they'll get through it," said Buddy Clark, a 33-year veteran of the energy finance space and a partner at Haynes and Boone. The financial pain has gotten so great that now there's murmurs of a bail out for the U.S. oil industry, though it's clear any assistance would run into political opposition. All of this raises the question: Is Wall Street doing enough to prepare for the oil storm? "One year from now, are you going to look back and say, 'Whoops, we didn't get ahead of this enough,'" outspoken banking analyst Mike Mayo asked JPMorgan boss Jamie Dimon during Thursday's conference call. Dimon said if it were up to him, he'd reserve against the potential for even greater losses. However, he said those decisions are limited by accounting rules. Still, Dimon said the energy portfolio makes up just a small portion of JPMorgan's balance sheet and many of the loans are backed by physical assets. That means banks can sell off assets to recover money if a company defaults on its loans. "We're not worried about the big oil companies. These are mostly the smaller ones that you're talking," Dimon said. Paul Miller, a banking analyst at FBR, said oil loans don't represent nearly the same threat to banks that mortgages did last decade. He also pointed out that banks have been forced to stockpile capital to help them absorb losses. "The big banks might have 1% to 6% of exposure. That's not going to kill them. This is not like 2006 or 2007," Miller said. Despite the turmoil, JPMorgan isn't planning to run away from the oil patch. "To the extent we can responsibly support clients, we're going to. And if we lose a little bit more money because of it, so be it," Dimon said.